In Part I of this mammoth piece, I analyzed Quinn’s relationship with the Cheerios, and power. Season 2 has shown us choosing to get her power back, for better or worse. Power is mostly equated to the “old” Quinn - the one that tortured Rachel Berry and had everything she ever wanted. Quinn’s kindness has been established. And now that she has chosen power again, she similarly must continue to choose kindness, or else the character development is lost. So what’s the status of Quinn’s kindness - and her friendships - in Season 2? For better or worse, Quinn is somewhat of an isolated character. In general, I appreciate this attribute of Quinn’s personality, but I do also like the idea of her interacting with others. It gives us some insight on how she’s conducting herself socially, which is part of her character’s huge change. Without Quinn having friends to interact with, it’s significantly more difficult to track her development. 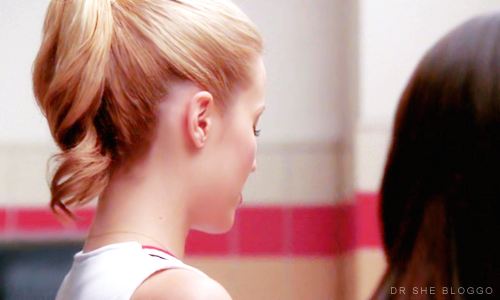 Quinn’s oldest friends, within the context of the show, are Santana and Brittany. I touched a little bit on the Quinn-Santana dynamic in Part I, but I made the mistake of surmising that Quinn and Santana were never friends, which is definitely an oversight on my part. Confounded absolutes! It’s more complicated than that, and unfortunately we don’t get a lot of concrete Santana-Quinn interaction without any piss or vinegar. It’s true that Santana’s loyalty to Quinn runs deeper than one would think - she didn’t rat out her pregnancy to Sue, yet Quinn ratted out Santana’s summer surgery. Quinn also slept with the guy that Santana had been quasi-dating. The question of loyalty is certainly interesting with these two. Regardless, Quinn and Santana can probably be easily classified as the tried-and-true, if somewhat superficial, distinction of “frienemies.” Season 2 opened up their dynamic instantly, with the fight in “Audition,” and then dropped it just as immediately. Remember in “Rocky Horror Glee Show,” Quinn and Santana both played Magenta? What a lovely opportunity to explore the dynamic of two friends and rivals playing the same role. Magenta, Head Cheerio - a great parallel could have been used there. But instead, we got to see Mr. Schuester needlessly overturn the whole production so he could be Rocky, and Season 2’s Quinn and Santana are relegated to sniping at and dancing with each other. Missed opportunities, party of OH-SO-MANY. Brittany and Quinn are even more mysterious. Quinn seems to have a permanent “WTF” face in Brittany’s company this season, but it’d be nice to see another dimension to the dynamic. I’m assuming Quinn is no exception to the “Brittany likes everyone” rule (aside from those few early episodes where Brittany was not quite Brittany yet) but as of yet it’s largely unexplored. Brittany's unerring and daffy sweetness would either drive Quinn crazy or be exactly what she needs. Either way, I'm game. All in all, Quinn’s post-pregnancy relationship with her erstwhile sycophants is maddeningly uncharted, and for a set of characters frequently packaged up and delivered as a trio, they rarely interact in a meaningful way. Change this, writers! Next on the list of Quinn’s friendships is Mercedes. The writers brought Ms. Jones in during the Back 9 for Quinn to relate to on the topics of body insecurity and feeling like a minority. Needless to say, I think we all did a double take. While my initial reaction to Quinn and Mercedes was one of skepticism, I have come to appreciate their dynamic and accept it as something that does need to be continued, even if it was originally a bit out-of-nowhere. Mercedes and Quinn were a very real entity in “Home,” "Laryngitis," and “Funk,” and Quinn even requested Mercedes to be in the delivery room with her when she had Beth. So far, in Season 2, the extent of their relationship amounts to occasionally sitting next to each other in Glee Club, and what’s sad is that we consider this an accomplishment of continuity. Even though they may not seem to be able to relate to one another in their current (lack of) storylines, their friendship needs to be present. Mercedes opened up her home to Quinn in a time when the girl did not have many good things going for her. This relationship should not just disappear. Speaking of relationships that should not disappear, we are now rounding the corner into perhaps my favorite dynamic the show has ever given us: Rachel and Quinn. It is perhaps a dangerous idea to get me ranting on these two, because I could write pages. PAGES, I tell you! Their relationship is genius in that it is tied inextricably into the show’s construct and the two characters’ arcs. YET, we find that after the first 13 episodes, their interactions are few, far between, and frankly, don’t speak to the reasons why these two SHOULD be interacting in the first place. Quinn and Rachel were initially designed to be enemies. Opposites. Cheerleader/loser. Popular girl/unpopular girl. Traditionally beautiful/unconventionally beautiful. They are each other’s foils, and represent the core dynamic the show addresses - Quinn is the embodiment of the Cheerios, the cool kids, and Rachel is the embodiment of Glee Club, the losers. On paper, they should hate each other. But in one of the show’s true brilliant moments, Rachel reached out to Quinn when she got pregnant, setting aside all past animosity, and made her feel accepted. This gesture itself is an embodiment of one of the show's main themes. What's not to like? My favorite Quinn Fabray moment is the scene she shares with Rachel, and then Puck, in “Sectionals.” I’ll expound on the Puck part later - for now, let’s discuss the Rachel portion. Rachel initially pursued Quinn with friendship, but her obsession with Finn led her to destroy his relationship with Quinn by telling him the secret of the baby’s father. But in this wonderful scene of tension, silence, and yet so much meaning, it is Quinn who forgives her for the transgression. This is the moment where Quinn chooses kindness, which is key to her character. It’s a beautiful scene. They are supposed to hate each other. They’ve both transgressed against the other, and yet... they don’t hate each other. What more, they actually complement each other. Beneath their superficial polarities, Rachel and Quinn are actually quite similar. Their character traits both deal with control and determination, and their arcs both speak to the negotiation of self vs. others. These factors simultaneously attract and repel one another, making for a fascinating dynamic. The fact of the matter is that Quinn and Rachel were designed to interact, and all signs at the end of “Sectionals” seemed to point towards this development. Of course, the Back 9 was sorely lacking in this respect, and the pair’s complete and utter dearth of screentime in these episodes makes me cranky to this day. Season 2 has stepped up, however, in that they’ve at least spoken to one another. “Brittany/Britney” finds Rachel asking Quinn for a favor in regards to Finn, which has got to be a touchy subject - and yet, Quinn obliged, in a scene we were unfortunately not privy to. “Duets” shows Rachel encouraging Quinn to sing with Sam and win the competition. However, this specific interaction, while lovely to see, has little relevance to what their dynamic should be at this stage. No, the original direction for Quinn’s and Rachel’s characters seems to have been largely dropped or ignored, and so I go into every episode hoping things will turn around, only to get irrationally angry when Quinn says she wants to punch Rachel in the face. Way to go, writers. I love it when you completely undo perfectly good character development for no good reason other than throwaway jokes. So, when it comes to Quinn and kindness, I want to see it manifest in the form of gratitude to Glee - Mercedes and Rachel in particular. We got a snippet of this in “Duets,” when she tells Sam she sticks with Glee because they’ve been good to her; and I won’t lie, I cheered when she said it. If I ran the show, I would push for the construct that Quinn is terribly protective of Glee Club out of thankfulness, and that she fights back when the Glee Club is threatened. But alas, I do not run the show, and instead Quinn toes the line when it comes to acting out against her popularity. Regardless, I still want some actual positive interaction between the people that Quinn has held tenuous friendships with, and perhaps even a storyline that allows for this to be developed simultaneously. Season 2 so far is generally on the right track, but still lacking in the character specifics. Quinn is capable of kindness, and even in her solitude, I want the writers to actively demonstrate that. Your tribute to Quinn's and Rachel's fascinating relationship is the type of work that makes me want to be a writer. Amazing. You're very welcome. I admire that you're confident enough to share your opinions and most important, you back them up with facts. It is something I work to achieve every day as a writer and as a person. And you can't go wrong with Quinn and Rachel. I love both of them beyond belief.